I decided to make the smallest size possible which is a 2T because if the baby is born in April, she will be 8 months old in December and with rolled up sleeves, this size will likely fit well with a little room for growth. I always put my children in sweaters that grew a little bit with them. Because I was knitting a gift, I did knit a swatch for gauge. If it was for me I might not have done that but I wanted it to be sized accurately. And away I went. Here’s a great tip! If you start with the sleeves, you can consider them your swatch. For those who don’t like to swatch, you can start your project right off and if your gauge is off you have a lot fewer stitches to pull out. Splitting the stitches for the neckline … and then on to the collar and hood! The sleeves are attached very simply by stitching them onto your needles along with the sweater body. Decreases all around for the shoulders and we’re getting closer and closer to a finished garment. At the neckline, the stitches split and you knit back and forth for the neckline and hood (if you choose to add one … and I love children’s hats with hoods!) Again, very simple. The only “glitch” that I can see in the pattern is that there is a repeat of a few knitted stitches on the edge of the hood, which I am too much of a perfectionist to accept. So, I chose to knit all of the edge stitches on one side and purl all edge stitches on the other side. That way, I get a “perfect” edge. 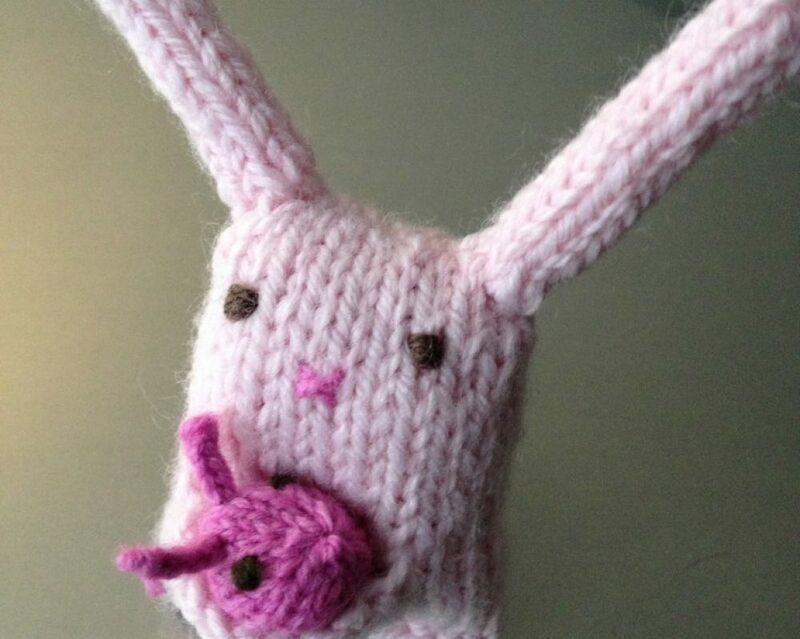 You’ll see what I mean when you knit this cutie! At the end of the hood, you’ll graft all the stitches together with a Kitchener stitch and ta-daa!!! I added a tassel to the hood because I really liked the hassle that I added to the first WW that I knitted for my niece. All you have to do is graft the underarm stitches and all the seaming is done. Don’t you love that!? I sure do! Use a long piece of your seaming yarn to tighten up the “holes” at each side of the underarm. This is a trick you can use in lots of patterns. Just a few underarm stitches to graft … that’s it for seaming! Underarm “holes” are easily tightened up! So, there you have it once again. The Wonderful Wallaby. I love this pattern so much that I am knitting one for myself in oatmeal-colored wool. You can be sure you’ll be seeing it when it’s on the needles! Queen Bee Knits label is placed on the inside of the bottom … don’t want it rubbing baby’s neck!